Answer: There is indeed something special about craters near the poles. First, I should note that liquid water cannot exist in a vacuum. What they’re talking about here is water ice. Second, craters large enough to see with binoculars or a telescope have depths ranging from 500–5000 meters (1500–15,000 feet). And it’s in these deep craters near the poles where ice has been detected by orbiting spacecraft. The image below shows the Moon’s south pole as imaged by NASA’s lunar orbiter. The “blue” of the ice is a false color added for contrast. Similar images were obtained for both poles. 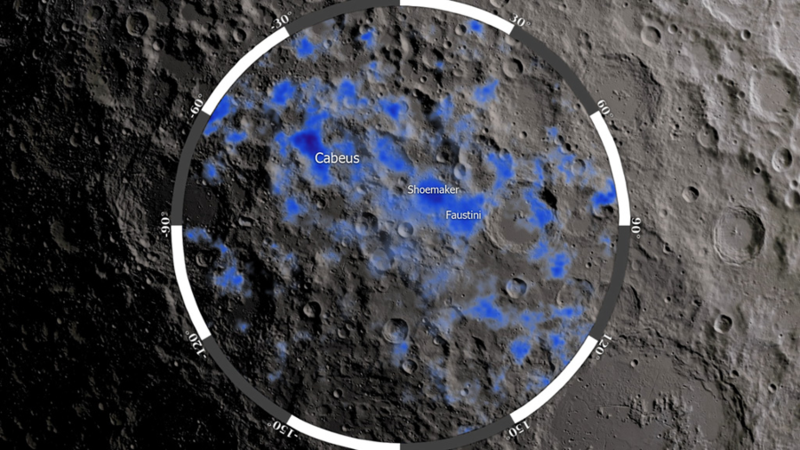 Because of the tilt of the Moon’s orbit, more south pole crater floors are shadowed compared to those at the north pole, but ice has been detected at both locations. Click to enlarge. The Sun’s path through the sky changes over the year resulting in our four seasons. The Sun, as seen from the Moon, does the same thing. Of course, with no atmosphere, the Moon doesn’t experience seasons the way Earth does, but the elevation of the Sun in the sky changes all the same. The animation shows the Sun’s change in elevation as seen from the Moon’s north pole. At its highest point in the sky the Sun is a mere 1.5° above the horizon. [The variation is exaggerated in the animation.] You can see how the floor of the crater never gets any sunlight. Exposed regolith is heated by the Sun to a temperature of 127 °C (261 °F) to a depth of around 20 cm. Regolith in the shade cools to -173 °C (-279 °F) — cold enough to preserve water ice. And there is permanent shade at the bottoms of many polar craters. This ice is not in a glacier-like slab, as the animation represents. Rather, it’s much like a “layer cake” with alternating deposits of ice and dust. Scientists suspect these deposits are the result of icy comets that collided with the Moon over geologic history. A collision would scatter water/ice/dust debris over a large area. Any ice deposited near the poles would be preserved at the bottoms of deep craters. Any that falls elsewhere would rapidly vaporize, dissociate into ions from the intense UV, and escape into space. Analysis of a core sample from one of these deposits would tell us a lot about the impact history of the Moon. 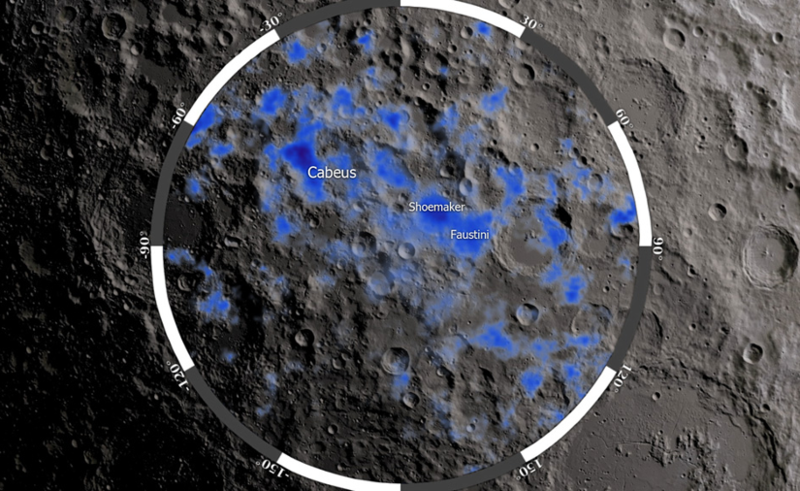 Finding ice on the Moon is important for many reasons. Colonization of the Moon would be extremely difficult if water had to be carried up from Earth. SpaceX claims their Falcon Heavy rocket can lift payloads to low Earth orbit (LEO) for $2200/kg, but water is heavy — almost 4 kg per liter (8.3 pounds per gallon). To send the water all the way to the Moon would increase the cost by a factor of 5–6. So being able to obtain the water on the Moon makes the process of setting up permanent bases far more doable. In addition to the usual drinking and cleaning and bathing (the Moon is a dusty place), water can be used to make fuel. Two H2O molecules can be dissociated by electricity into two H2 (hydrogen) molecules and one O2 (oxygen) molecule. Once separated they can be recombined by burning a mixture of the two — good for everything from welding metal to rocket propulsion. And of course, the oxygen can be breathed. The lunar poles would be good locations for the first permanent bases. At the tops of mountains (as opposed to the bottoms of craters) sunlight is nearly continuous. It’s a situation equivalent to the midnight sun here on Earth. That, and the lack of clouds, means arrays of solar cells could produce energy nearly constantly. And a reliable source of energy is needed for habitation, manufacturing, building, and electrolysis of water. 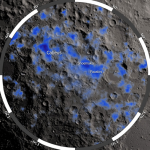 Of related interest is the recent discovery of lunar soils that contain hydrates — minerals that have chemically combined with water. It takes more energy to extract this form of water, but it appears there’s a large amount of hydrates available. Between this source and the polar ice, there’s enough water on the Moon to support a thriving permanent colony. Of course, as done on the International Space Station, all water would need to be recycled. The cost of extraction will always be higher than the cost of recycling.